Accumulated blob of grim at the bottom of the removed sprocket cover. Not too impressed with this amount of accumulated grime at just 800km. Gasp! 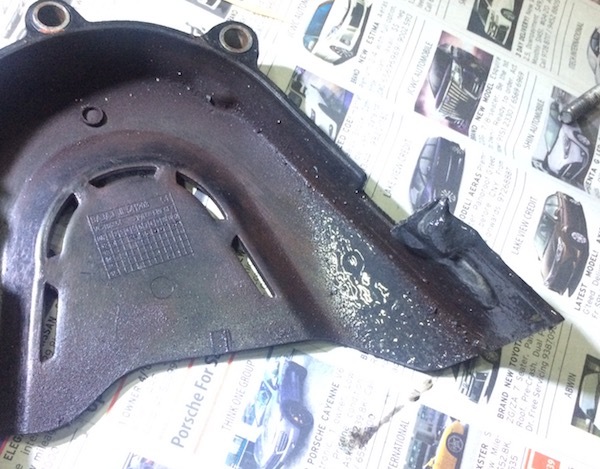 It accumulated a good amount of gooey grime too! Determined to have my newly installed chain last quite a bit longer than my previous chain, I spent about 5 mins cleaning the gunk up. Grime surrounding the newly installed chain at the front sprocket area. It’s not too evident in this picture as it was taken in low-light. Disappointed, with the condition of the sprocket area, it suddenly struck me that it must be the chain lube that I’ve been using – Motul C2 Road Chain Lube. While I must admit that fling is minimal, I think Motul’s C2 chain lube has a tendency to attract dirt and grime – LOTS of it! 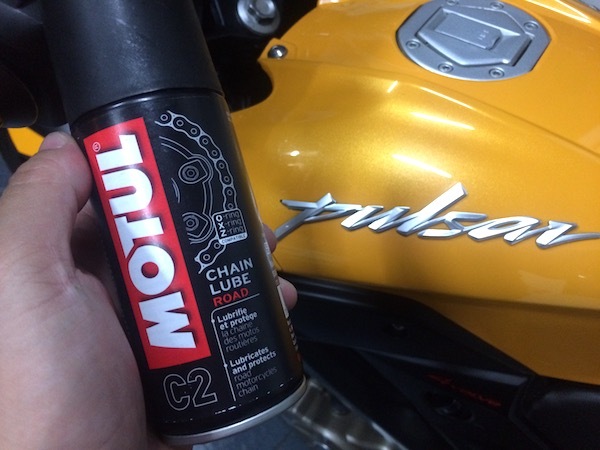 Motul C2 Road Chain Lube – the secret sauce for front sprocket grime? Perhaps it’s time for me to try another lube. Or maybe I should seriously consider an automatic chain oiler instead. I might just consider them… if they weren’t so expensive… Hahah. Certainly a consideration… Thanks for the tip. 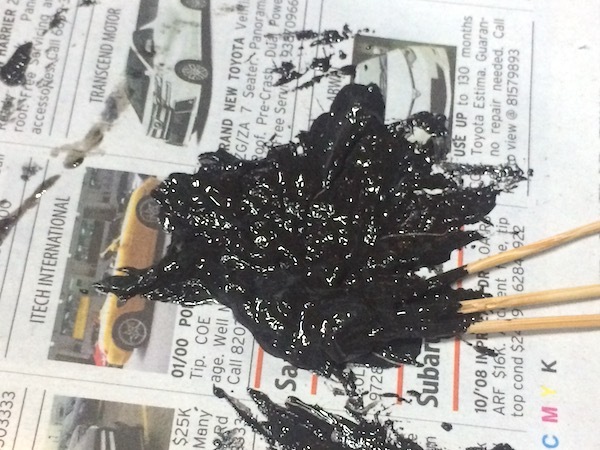 Though I’m just not too sure about the used engine oil – especially with all the engine impurities floating with it. I tend to use “branded” oils for my engine and would rather save that 800ml for the next oil change session! =P Would consider cheap gear / engine oils though. I still have a bottle of Mobil 4T dino oil remaining from the last time I used it to flush my engine after it got contaminated with coolant. Just use gear oil. A bottle goes a long long way. The Honda Super4 manual actually recommends it, rather than commercial sprays. @chriszzz, yeah… I know of people doing that. Only thing is having to deal with messy fling – possibly even when applied lightly. Otherwise gear oils are known to be great chain lubes too! 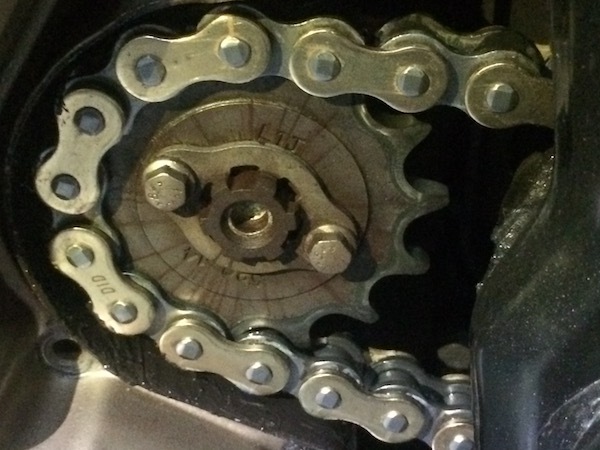 I know of a friend who told me he does not clean or oil his big bike (750cc) chain since new. And still managed to eke out approx. 25000-30000km (mostly commuting in rain or shine) from them before requiring sprockets & chain replacement!!? Now is that believable (or not)? Well, perhaps for safety sake it may be unwise to stretch it that far…cos I read from somewhere that a snapped chain on a bike at speed can do horrible damage to the drivetrain/engine & possibly/surely cause a horrible crash too. Not worth penny-pinching here…. You can try maxima chain wax!!! Do check the reviews online. Yeah – I’ve certainly heard great things about Maxima’s Chain Wax. It’s a little curious that it’s twin brother, Maxima’s Chain Guard didn’t seem to get as much attention comparatively.